You'll escape to carefree days whenever you wear this adorable Aaron Basha baby shoe from the Shoe collection. 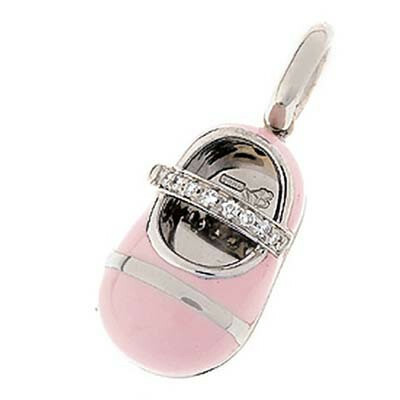 The baby shoe is set in luxurious 18kt white gold with a pink enamel coating and a white gold stripe across the toe. Sparkling white diamonds adorn the shoe strap for a sparkly festive touch and added shine. This Aaron Basha charm will make an enchanting addition to any charm bracelet or necklace!